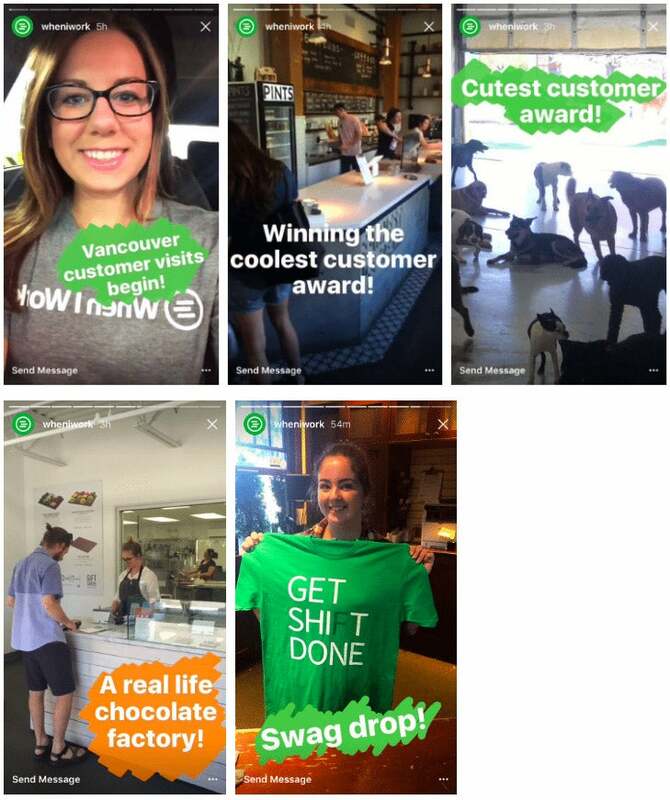 Here are 18 businesses using Instagram Stories to boost their branding. Ten billion. That’s the number of videos people watch on Snapchat every day. The same potential consumption (maybe more) exists for Instagram Stories -- quick videos and photos that disappear after 24 hours, just like Snapchat, but with an audience of 500 million users. Does that sound like a channel worth exploring? We believe so! Storytelling has always been a key part of marketing, and features like Instagram Stories are empowering us marketers to tell better and deeper stories about our brands. We’d love to provide you with more resources about Instagram Stories so that you can master this platform and see your voice spread. In this post, I’d love to share 18 Instagram marketers who have been doing rad things with Stories to give you some inspiration on what you could do for your Instagram Stories too. From my research, I discovered several creative ways brands and individuals have been using Instagram Stories. And here’s the great news: most of these strategies do not require a huge budget or resources to pull off! Before we dive into each brand and individual, here’s the full list of rockstar Instagram storytellers with links to their Instagram profiles. 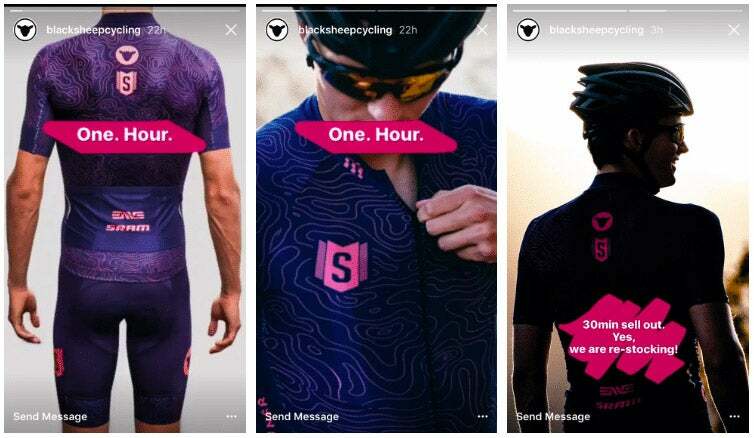 Without further ado, let’s take a closer look at how each of the following brands and individuals uses Instagram Stories and see how you might take inspiration to adapt their strategies for your own brand! This is one of my favorite ways of using Instagram Stories: telling a deep story behind each and every Instagram post. One of the key differences between Instagram and Snapchat is that Instagram provides a public, viewable profile for your main content. On no other social network can you get this type of supplemental information about the posts themselves. This makes NASA’s use of Stories quite the native strategy. 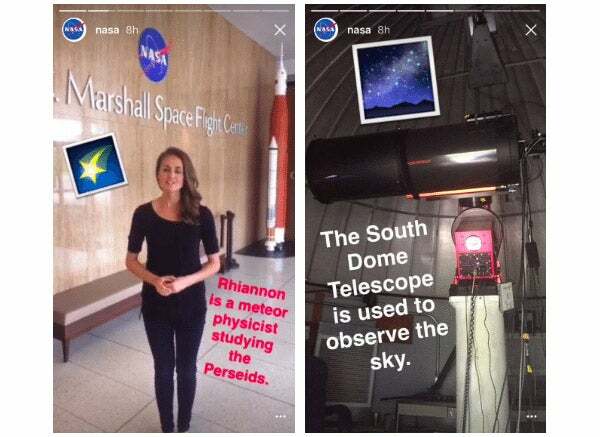 Here’s a great example: Recently, NASA posted about the annual Perseid meteor shower on their Instagram account and used Stories to share more about the meteor shower and the research on it, talking to the scientists involved in the research and showing the equipment used for the research. Zoom out and photograph the setup -- works great for product shots to show all that goes into getting the photo just right! LOFT, a women’s clothing brand, invited two best buddies for a style challenge, which was shared as an Instagram Story. The challenge: Find something (in the LOFT store) the other didn’t think she could wear. 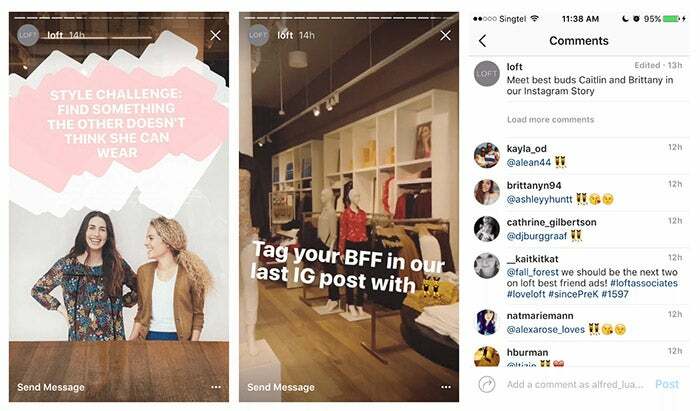 Not only did LOFT allow their followers to follow along the fun challenge, LOFT also gave them an opportunity to engage with a recent Instagram post and help spread their brand by asking them to tag their best friends in the post. Otherwise, consider if you could organize fun games around your product or service which your online community could participate in by leaving a comment on one of your recent Instagram posts or sharing a photo with a particular hashtag. 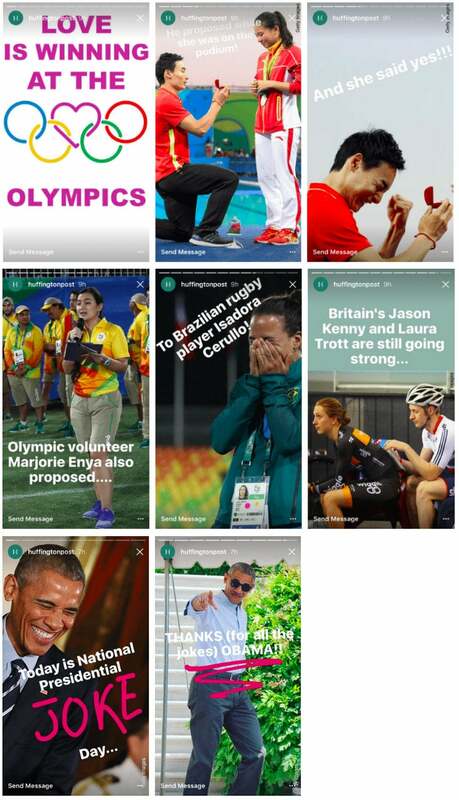 With the help of the text and drawing functionality of Instagram Stories, Huffington Post has been creating interesting short photo summaries of recent news, allowing their followers to consume their content in a more visual and fun manner. Go through all your recent blog posts and challenge yourself to turn one of them into a photo story. Adding captions will tend to make it easier while drawing with the three different Stories markers will bring more personality to your story. Quite similar to Huffington Post, TechCrunch has been using Instagram Stories to share headlines and short text summary of recent tech news. If you publish lots of content regularly like a news or media agency, summarize your articles with a headline and a tagline or sentence. 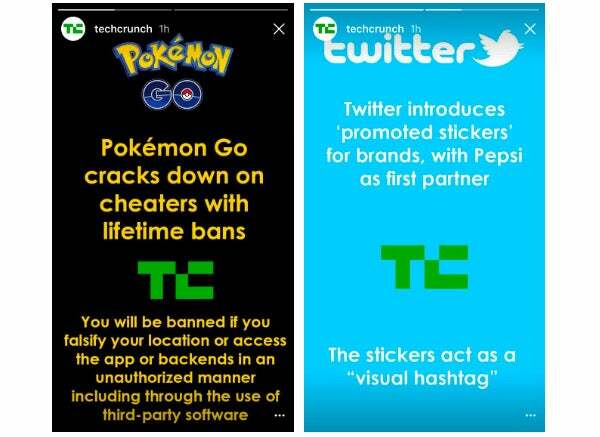 If the news is shareworthy, adding your brand logo, like how TechCrunch did, could help to spread the awareness of your brand. 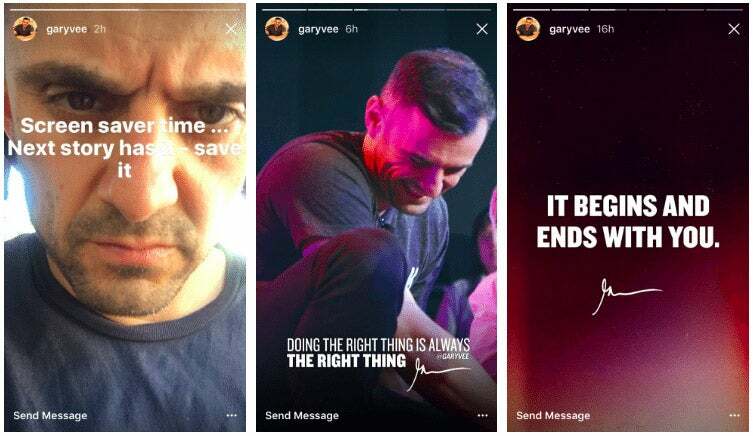 Gary Vaynerchuk has been using Instagram Stories for several purposes -- promoting his DailyVee videos through high-quality visuals, sharing very authentic glimpses into his daily life and connecting genuinely with his followers. In a recent Story, he mentioned that his followers asked for more wallpapers on his Instagram Stories and so he made more for them. 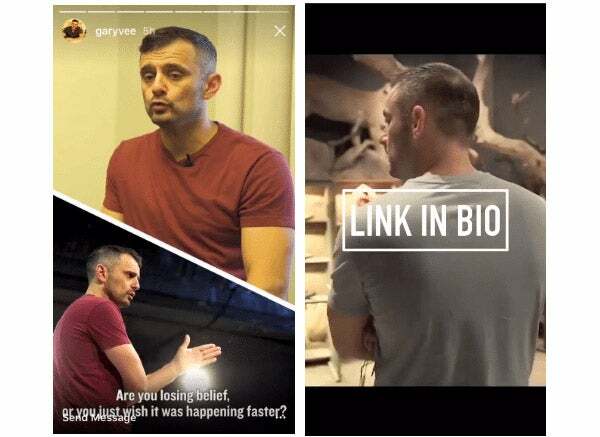 If you produce video content as part of your marketing strategy, consider creating an extra version for the vertical mobile screen or simply add borders at the top and bottom, which Gary Vaynerchuk does sometimes. If you tend to use your Instagram posts to drive traffic to your content on your blog or Medium publication or YouTube channel, create promotional images and mention that the link is in your bio. If you create images for your social media posts, make an additional image for the vertical screen or reuse the one you created for Pinterest. Use Instagram Stories to do research and interact with your community. What types of content do they want from you via Instagram? How can you provide those content to them? Chris Burkard is a very talented photographer with almost 2 million followers on Instagram. 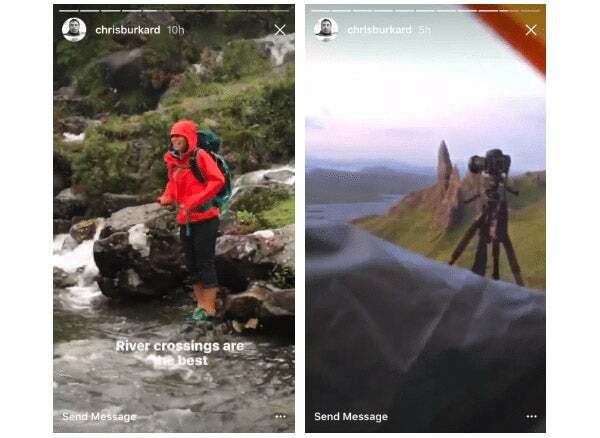 He has been using Instagram Stories to take his followers through his adventures where he captures the jaw-dropping photos he shares on his Instagram accounts, including river crossings and camping outdoors with very windy conditions. While not every business might have such adventurous experiences on a regular basis, your followers might be interested in what your company does on a day-to-day basis. Think about some of the fun aspects you could show them, such as brainstorming sessions, team lunch, company games and more. New York University has a very engaged following on Instagram. Each of its posts has thousands of likes and 10 to 20 comments. 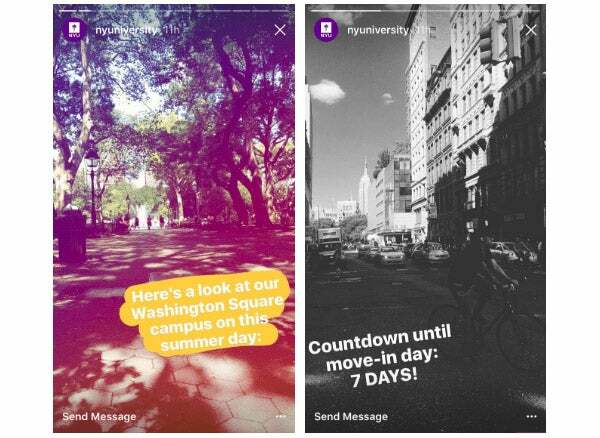 Following the theme for its posts, New York University “takes” its followers on tours around the campus and city, enhancing the experience of following the account. This is great if you are a tourist attraction or school or even a retail store with a great physical space and environment. When you are taking your afternoon break and going out for a walk, snap a few photos of interesting sights or locations and share them with your followers. These raw authentic snaps will give your followers a better sense of the area and might make them want to visit you more. GoPro is one of the brands I think of when I think of adventures. 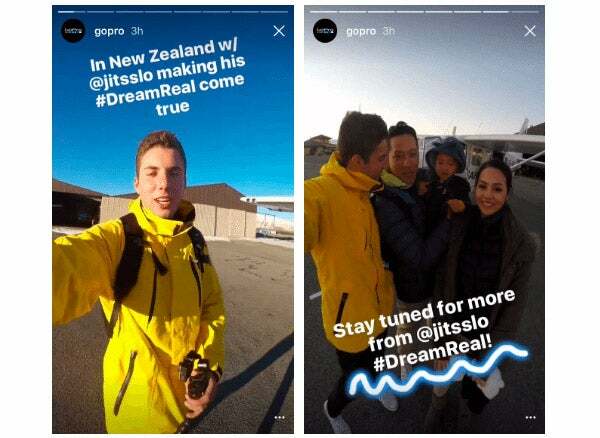 When Instagram Stories was launched, GoPro jumped onto the opportunity to share more footage taken with, yep, GoPro. Recently, while making its GoPro family member’s dream come true of seeing the aurora australis, GoPro shared the adventure with its Instagram followers through incredible video footages of the trip. If you are an outdoor activities company, share all the thrilling and breathtaking videos of the outdoors with your followers. Use Instagram Stories to promote your company’s hashtag and encourage more people to use it. Show how happy the winners of your giveaways are or how awesome your giveaway prizes are to attract more people to participate in them in the future. When I Work is employee scheduling software with over 15,000 happy customers worldwide. Recently, they visited a few of their customers in Canada and featured them in their Instagram Stories. If it is possible, visit your amazing customers and give them a shoutout on your Instagram Stories. This will let your followers know what types of businesses and individuals use your product and might give them the social proof they need in order to convert. Furthermore, this will help you build a stronger relationship with your customers. You might not always be able to visit our customers like When I Work so Shopify worked around that by letting merchants, who use Shopify for their business, take over the Shopify Instagram account and share about their business. 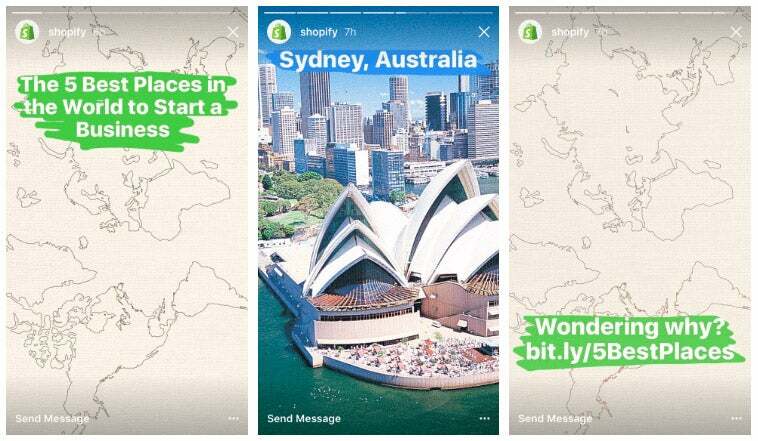 Apart from merchant takeovers, Shopify also promotes their blog posts through Instagram Stories. With the blog post you want to promote, find 3-5 key points that will grab your followers’ attention. Turn them into fun Instagram Stories using relevant photos, captions and drawings. Create a simple bit.ly link to be used for the last photo. Bonus: It will be great to download each Instagram Stories photo onto your phone as you create them and post them all at once when you are ready. This will help to ensure that your followers see the full set of photos at a go. Remote Year is a year-long program where 75 digital nomads travel across the world to work and explore 12 cities together. Through their Instagram Stories, they share what they do on, I believe, a daily basis, allowing their followers who might not be able to join the trip to still be part of the fun. Black Sheep Cycling is a cycling brand that provides innovative and unique cycling apparel. A few days ago, they launched their ambassador kit for their community. 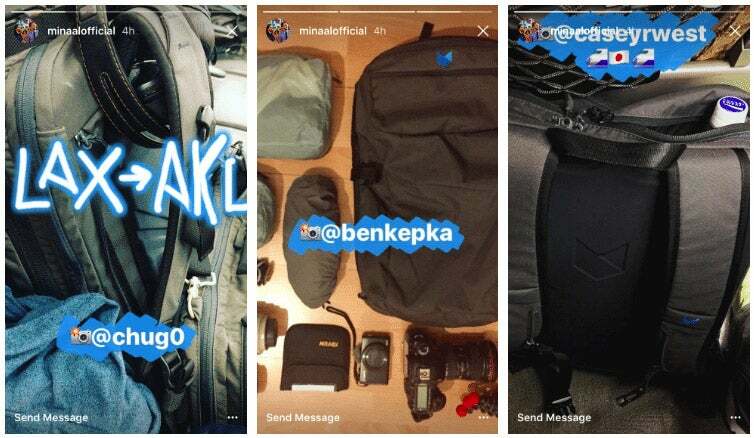 Besides announcing the upcoming launch with an Instagram post, the team also used Instagram Stories to showcase the kit from various angles. 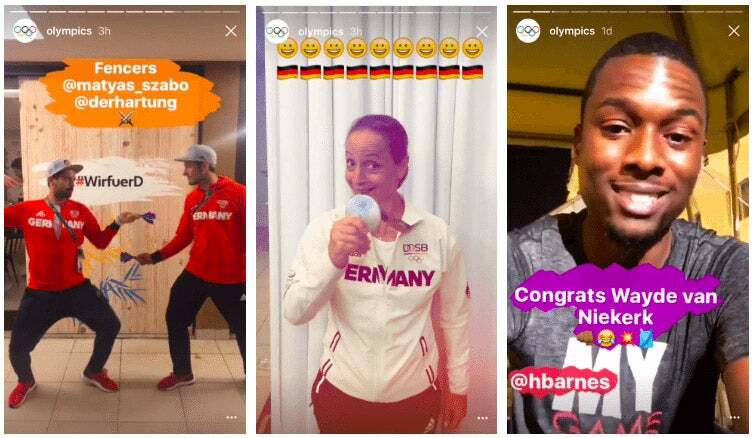 When the Rio 2016 Olympics was taking place, the social media team behind the Instagram account took the opportunity to share more about and celebrate the incredible Olympians. Harrison Barnes also took over the account to give a wrap-up for a day and shared his thoughts on the day’s events. Brian Fanzo, popularly known as isocialfanz, is a millennial speaker who is very knowledgeable about community building, social media, livestreaming, influencer marketing, tech and more. In 2016 alone, Brian will keynote at more than 40 events around the world. 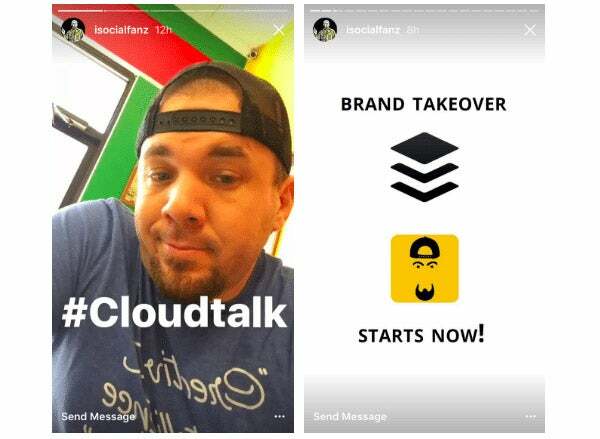 He has been using Instagram Stories to give previews for his upcoming talks and events such as the #Cloudtalk. He did the same when he was taking over our Buffer Instagram Stories while Brian, our Social Media Manager, took over his. Work with other brands and influencers to take over your Instagram account and ask to take over theirs too. Like Gary Vaynerchuk said, “It’s an easy way to reach new audiences and increase brand awareness.” And it’s great because both parties stand to benefit from the takeovers. A cool feature of Instagram Stories is that it allows you upload any photos and videos that were added to your phone’s camera roll within the last 24 hours. Simply swipe down while you are in the Instagram Stories camera mode. This allows you to share photos and videos from the brands and influencers without having to share your Instagram account password. Get them to create Instagram Stories and save them onto their phones without posting them. Get them to send their draft Stories to you via email, Dropbox or Google Drive. Download them onto your phone before the time you wish to post them (you will have 24 hours to use them after downloading them onto your phone). Wait for the right time and voila! Minaal makes durable, professional travel gear that gets you where you want to be -- faster, happier and more productive. In their Stories, they share photos from their community who are traveling all around the world with the amazing travel bags and gear. Many a time, we love to showcase our users’ photos of them using our products, only to realize that the photo quality might not be on par with those we post on our profile or it might not match the theme of photos we chose for our gallery. Instagram Stories provides a great option to feature your users (and your product) without changing the theme of your Instagram branding or adding too many photos to your gallery. 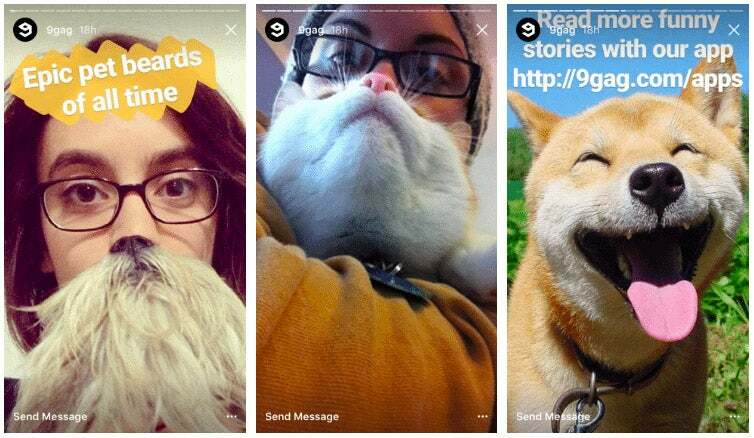 Invite your users to share photos of themselves using your product and let them know that you will be featuring them on your Instagram Stories. Reach out to those users and ask if you could feature their photos and them on your Instagram Stories. Once you have the photos, add their Instagram handle and perhaps add some drawings to the photos to make them more interesting. I think most of us are quite familiar with 9gag and their hilarious content. 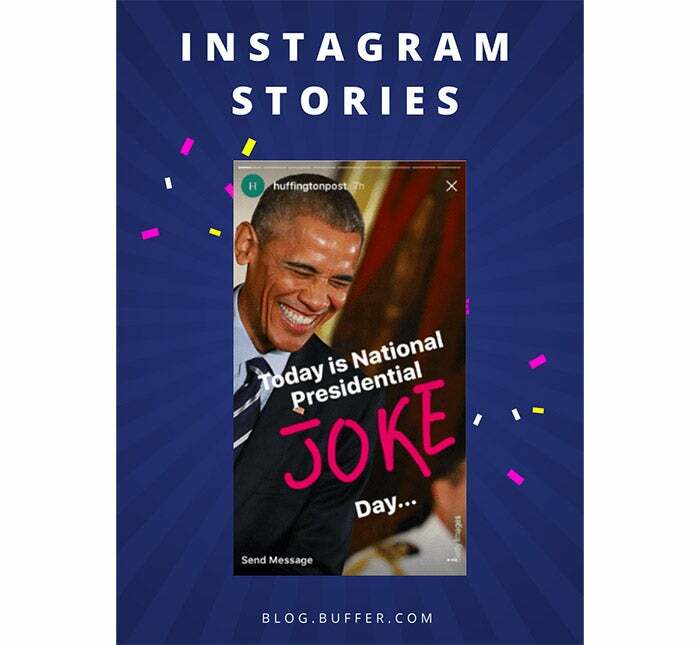 With Instagram Stories, they brought their funny storytelling to another level! I believe most businesses aren’t like 9gag in terms of the amount of user generated content they have (thought it’s great if you do!). However, this does not mean we cannot learn anything from 9gag. I think 9gag is a great example of telling the same stories through different formats (on their website, Instagram posts, Instagram Stories and more). When you have a story or message to share with your audience, come up with a storyboard of the photos and videos you need. Download the materials onto your phone and add captions and drawings to make them more engaging and visually appealing. When the time is right, publish all of them together according to your storyboard. Bonus: You could use an Instagram post to briefly talk about the story and direct your audience to check out your Instagram Stories for more information. Sean McCabe used to be a hand lettering artist who charged five-figure rates until he launched a course teaching people how to do what he did and made six figures in the first three days. Since then, he has been teaching a variety of courses on building and growing a sustainable business. 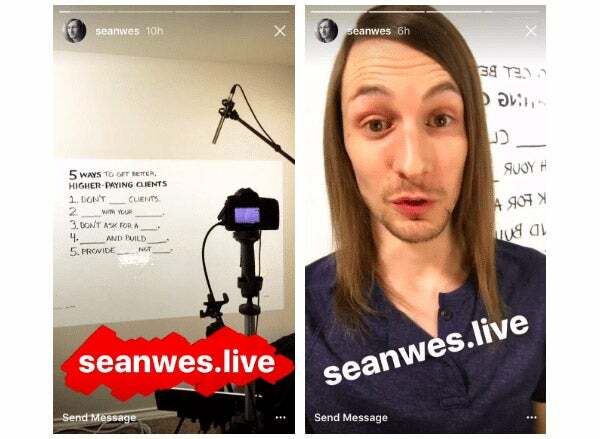 He has been using Instagram Stories to share sneak peeks of his live training and why his followers should sign up for his courses. Personally, I like to find out as much as I can before I pay for a course, a product or a service. 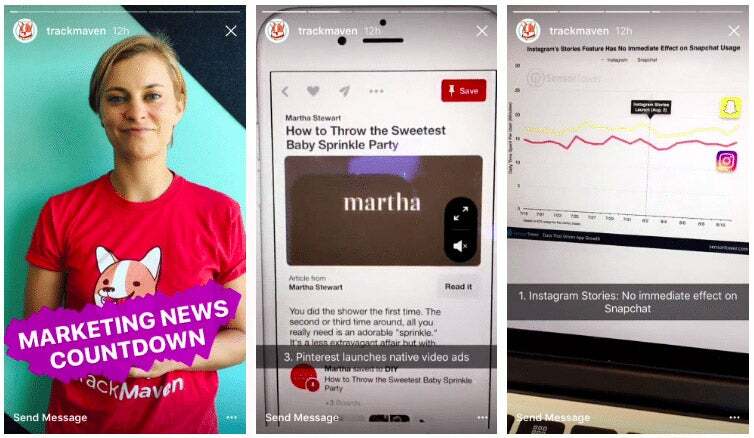 Quite similar to a trial for a product or service, Instagram Stories could be an interesting way to share just enough to entice your followers into signing up for your paid courses or exclusive content. Also, sharing a short memorable link makes it easier for your followers to act immediately. TrackMaven is a marketing analytics software tool that helps marketers make smart decisions through understandable and actionable data. 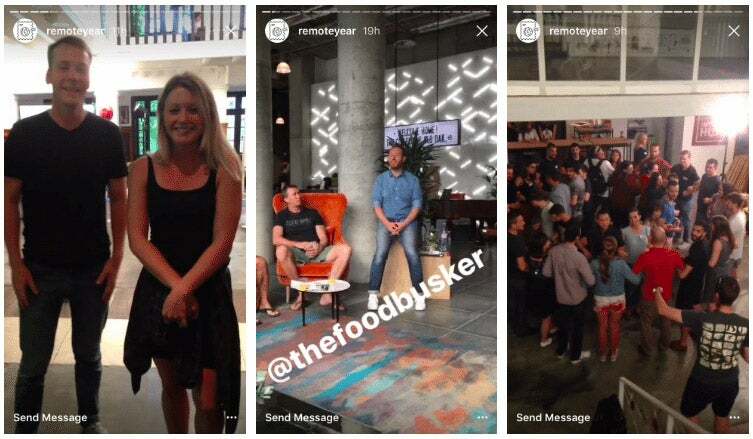 In line with their area of expertise, they share top marketing news every week in their Instagram Stories. When reading through all the news, bookmark the top 3 to 5 pieces which are most shareworthy or most useful to the people in the industry or your customers. On Friday each week (or even every morning), share the news. Adding your thoughts about the news could help to make you a thought leader in your industry too. Follow Entrepreneur on Instagram for inspirational visual stories.